This is a historic election for the Warner Unified School Board in the Northern East County of San Diego. This is the first time in District history that two Natives will be serving on the five-person School Board. Historically, the challenge for equality and educational opportunities has been a long and constant struggle. In 1950, Indians were segregated in San Diego County schools and labeled retarded as a result of IQ tests that failed to register cultural differences in children. Not one Indian graduated from high school in the county that year. Rights guaranteed the Kumeyaay as citizens of the United States under the Treaty of Guadalupe Hidalgo did not become a reality until the passage of the U.S. Indian Citizenship Act in 1924, and American Indian Religious Freedom Act of 1978. Then there is the nagging issue of water rights. Just as the loss of good land created havoc with the ability of California Indians to provide for themselves, the newcomers' insatiable thirst for water proved devastating, water rights issues were litigated early in the century, and continue today. When I was of elementary school age, I recall Steve Ponchetti from the Santa Ysabel Band of Diegueño attending the Warner school board meetings. Despite the intergenerational trauma that has burdened our community, there were families and neighbors on many of the local Bands that persisted in seeing that the children had an opportunity for education. They continued to work and make a difference in our community. I remember seeing Florence and Steve Ponchetti, when I was a teenager, going to meetings or to pray at some ones wake or funeral. Most of the boys in the house were from different local bands and attended Warner and then Julian for later grades. Years later when bussing children to school became the national focus of the politics and press, I could not understand the problem. For most tribes in the Americas if you don’t ride the bus you cannot get to school! Warner Unified School Board member Brandie Taylor is the Vice-Chairman of the Santa Ysabel Band. She attended both Warner and Julian Schools in her formative years. 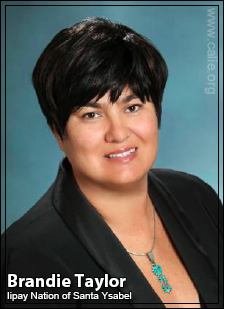 Brandie Taylor is the vice chairwoman of the Iipay Nation of Santa Ysabel, an Indian tribe in Northern San Diego County. Ms. Taylor has dedicated her life to advocating for tribal rights, preservation of tribal culture, improvement of health and safety of native peoples, and she is an avid supporter of higher education for youth. Ms. Taylor’s many accomplishments include securing funding for Iipay Nation’s Tribal Social Services, which handles child dependency cases and culturally focused assistance for family preservation. She is also a member of many tribal, local, state and national groups that promote tribal self-determination, education, and health issues, among them the Kumeyaay Diegueño Land Conservancy, Intertribal Court of Southern California, and the Cal State San Marcos Native Advisory Council. Ms. Taylor has been recognized with the 2010 Community Leader of the Year Award and the 2004 Tribal Leader Award for Indian Child Welfare. The Warner Unified School Board members’ responsibility of dedicated representation is great because Warner Unified School has approximately 62 Native students which represent over 1/3rd of the school population. 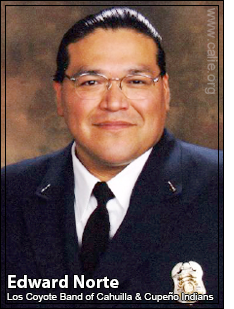 Warner Unified School Board member Edward Norte is an enrolled tribal member of the Los Coyotes Band of Cahuilla and Cupeño Indians, where he serves as an Executive Council member. He is the youngest of five children born to Marjorie Norte (Pala Band of Mission Indians) & Augustine Norte (Los Coyotes Band of Indians). He grew up on the Pala Indian Reservation and attended Fallbrook High School where he met his wife of almost twenty years, Gina Norte. Mr. Norte has been in the Fire Service for over twenty years, receiving awards for heroism for his efforts on the Witch Creek and Cedar Fires. He is currently an Engineer for the Barona Fire Department, where he has been employed the last twelve years. In 2004, Mr. Norte moved his family back to Los Coyotes; he became a volunteer at Warner Unified, where his three children attend and graduated from school. His volunteer efforts include, school sports, FFA, Indian Advisory Committee and school events, such as speaking to the young children during Fire Prevention week. Mr. Norte’s son, Jacob Norte, was the 2012 Salutatorian for Warner High School and is currently a freshman at Pepperdine University studying Political Science. His daughter Gabrielle is a freshman at Warner High School and his youngest child Gianna is a kindergartener at Warner Elementary. This past Election Mr. Norte ran for and was elected to the Warner School Board. We applaud their election and charge them with sincere dedication and responsibility for the future of our Native American children’s educational opportunities. Source and Notes: Personal communication Edward Norte and Brandie Taylor. KPBS celebrates cultural diversity by honoring Brandie Taylor during Native American Heritage Month 2011. WATCH KPBS on-line video & view transcript.